Microsoft Dynamics 365 Product Visualize requires an active Dynamics 365 for Sales instance that's associated with a Microsoft SharePoint site. This topic provides step-by-step procedures for setting up a new Dynamics 365 for Sales trial instance. Once the instance is running, see the Administrator Guide for instructions on adding users, products, opportunities, and models. 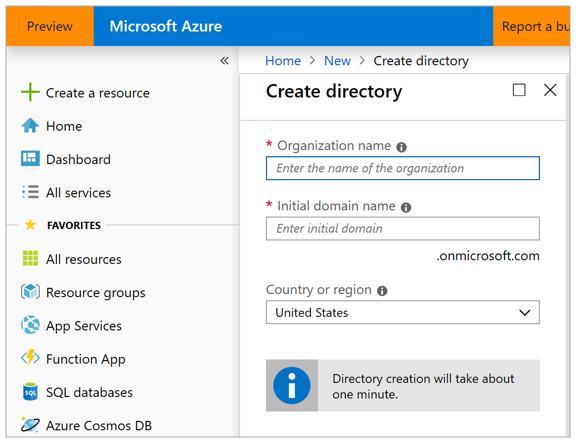 The first thing you need to do is create a new Azure Active Directory organization. This new organization provides a safe environment to try out Product Visualize that won't interfere with any existing Dynamics 365 instances. You can also use this organization to create and manage users, separate from your business organization. Sign in to the Microsoft Azure portal at https://ms.portal.azure.com. If your organization has multiple Azure subscriptions, select Directory & Subscription in the upper-right corner of the page to view the list of available subscriptions. 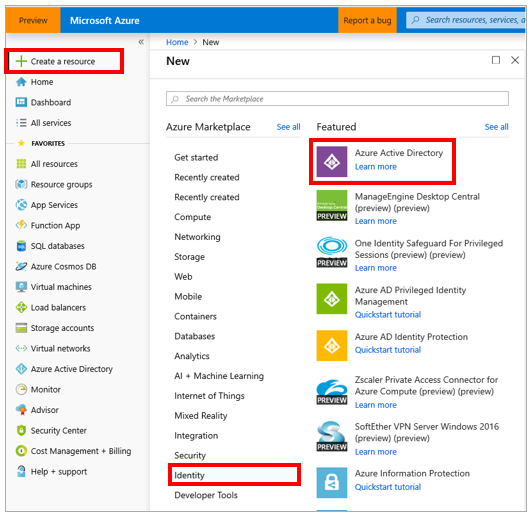 In the left pane, select Create a resource > Identity, > Azure Active Directory. Under Create directory, give the organization a name and an initial domain name. Select Create. You might need to wait several minutes while the directory is created. Select Click here to manage your new directory. After creating the new organization, the next step is to add an admin user for the organization. The admin user is responsible for creating additional users, assigning licenses, and initializing Dynamics 365. As the creator of this organization, you could use your work account to manage the system, but we recommend creating a separate administrator account for each organization. 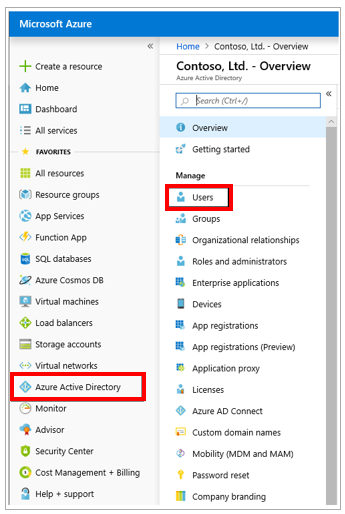 In the left pane, select Azure Active Directory, and then select Users. User name: Enter a fully qualified username (@<tenant>.onmicrosoft.com). Select Show Password, and then write down the temporary password. At the bottom of the page, select Create to finish creating the user. Product Visualize integrates directly into Dynamics 365 for Sales, which enables your salespeople to seamlessly transition from vital customer data into an engaging sales experience that changes the way customers think about your products. In a private browser window, go to the Microsoft 365 admin center at https://admin.microsoft.com. Sign in with the administrator credentials you created in the previous procedure, and, if prompted, set a new password. In the left pane, select Billing > Subscriptions, and then select Add subscriptions. 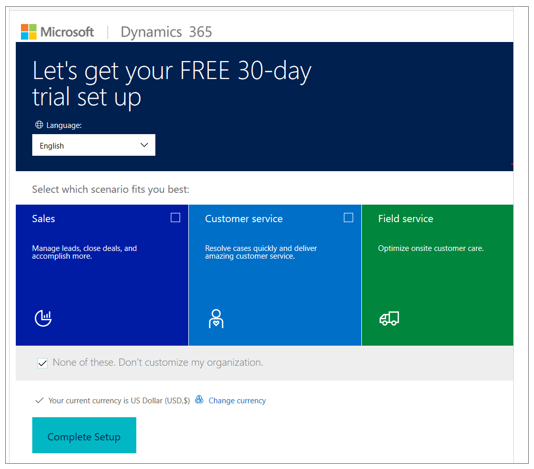 Find the Dynamics 365 for Customer Engagement Plan subscription, select the More Information (...) at the bottom, and then select Start Free Trial. On the summary page, make sure you're signing up for a Dynamics 365 for Customer Engagement Plan trial, and then select Try Now. On the confirmation page, select Continue. 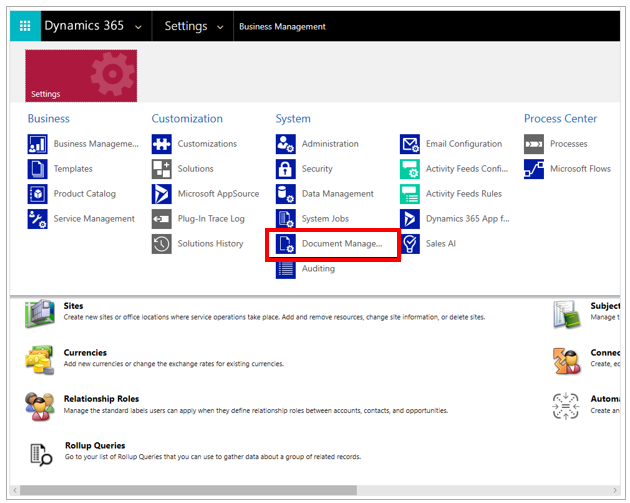 Before continuing, make sure the Dynamics 365 for Customer Engagement license has been assigned to the admin user. Go to the Microsoft 365 admin center (https://admin.microsoft.com). In the left pane, select Users > Active Users. Double-click the name of the admin user created earlier. Next to Product Licenses, select Edit. 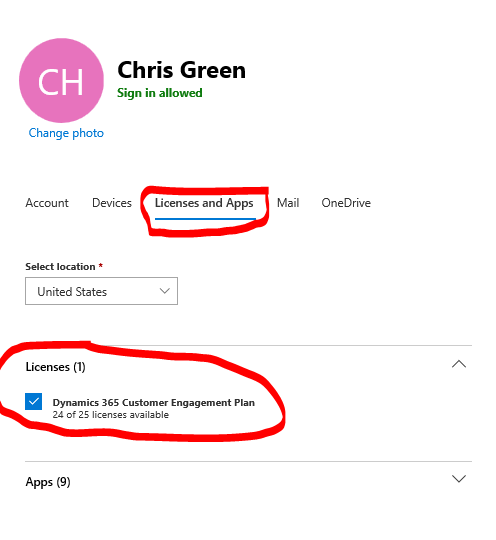 Move the slider to On for the Dynamics 365 for Customer Engagement Plan license. Save your changes and close the dialog box. The next step is to set up the Dynamics 365 for Customer Engagement instance. This procedure provides step-by-step instructions for manually installing Dynamics for Sales, which generates a completely empty instance of the Common Data Service. 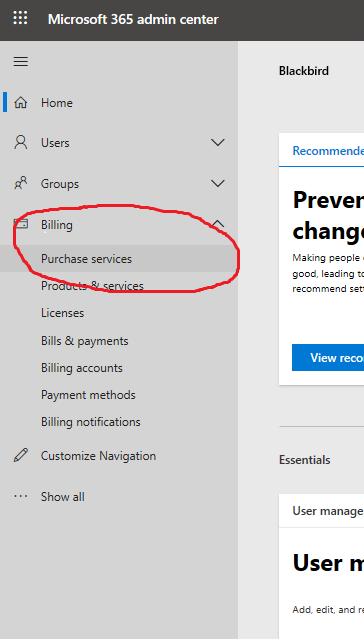 In the Microsoft 365 Admin Center (https://admin.microsoft.com), in the left navigation, in the drop-down list for Admin Centers, select Dynamics 365. It might take a minute or two for this option to appear in the Admin Centers list. As an option, you can select Sales from this drop-down list, which allows you to skip steps 5–7 in this procedure. However, this installs some additional sample data that might not be relevant to your organization. Set the language to your preferred language. Under Select which scenario fits you best, select None of these (assuming you didn't select the Sales option in the preceding step). Set the currency to your preferred currency. Select Complete Setup, and then wait for the initial setup process to complete. In the left pane, in the Admin Centers list, select Dynamics 365 Admin Portal. On the Instances page, you should see your newly created instance selected and some properties in a gray box on the right. Your new solution is still being set up. Wait for setup to complete before moving on to the next step. It can take around 10 minutes for the setup process to finish. You'll know the process is complete when you see CRM Hub listed under Solutions for your instance. Refresh the page periodically to check on the status. Select the small Edit button next to the word Solutions in the gray box on the right. In the list of available solutions, find Dynamics 365 Sales Application, and then select Install. Review the Terms of Service. When you're ready, select the check box that shows you approve. This starts the installation. This process might take a while to complete. You can refresh the page to view the current status of the installation. On the Admin Center page, select Open next to your organization name in the gray box. Select Sales Hub in the list of available applications. Select Settings in the upper-right corner of the page, and then select Advanced Settings. In the navigation bar at the top of the page, select the arrow next to Settings, and then select Document Management. Select Enable Server-Based SharePoint Integration to set up the connection to SharePoint. If you opted to use the automated Sales setup option earlier, you can skip the steps to enable server-based SharePoint integration. Continue through the setup. When prompted, enter the URL for your SharePoint instance (https://<org name>.sharepoint.com). Be sure to enter the full URL for your SharePoint instance, including https://. When complete, return to the Document Management settings page, and then select Document Management Settings. Enter the URL for your SharePoint site if it isn't filled in by default. Then select Next. Continue through Setup using the default values for the remaining options. Dynamics 365 automatically creates SharePoint folders for Dynamics 365 entities. After you've finished the setup process, you'll have an Azure Active Directory organization complete with Microsoft Dynamics 365 for Customer Engagement and SharePoint. At this point you can start adding opportunities, products, and models to Dynamics 365 for Sales. For more information, see the Administrator guide.